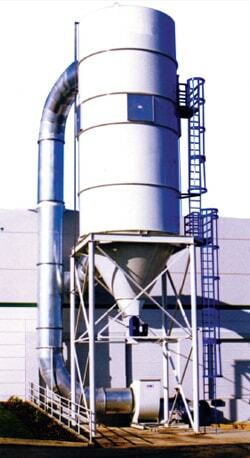 The LP series of top-bag removal bag-houses is the premium choice for the grain and processing industry. The smooth air cleaning technology completely purges each bag once per minute using the fewest moving parts of an type of filter on the market today. The totality of the bag cleaning system consists of a rotating reverse air arm and a direct drive centrifugal fan all mounted in the clean-air top walk-in plenum. No belts, solenoid values, diaphragms valves, pressure switches, pumps, pressure tanks, timing mechanisms or other moving parts. In addition, this unit features tool-less top bag removal, making a messy and tedious job as simple and quick as possible.